Despite the best efforts of the Beast from the East 1 Spring is definitely on the way. The snowdrops and crocus have been out for some time, willow is looking good, large queen bumble bees are searching for nest sites and the temperature here in Fife has consistently reached double figures during the warmest part of the day for the last week. Consistently … but only just and only briefly. Consequently it’s too cold for full inspections and the only colonies I’ve been ‘in’ are the two described below. However, I’ve not ignored the others. I’ve lifted the crownboard on most colonies to determine their approximate strength (or just peeked through those with perspex crownboards which is even less intrusive) and have continued to heft colonies to see if they have enough stores. Those that were feeling a bit light have had a fondant top up. I’ve also given several colonies a pollen boost to help them rear early season brood. Other than that – and moving colonies to the new bee shed – I’ve left them well alone. On the warmest part of the warmest day of the week I visited the apiary to check the colony strength. With the exception of two, all were flying well with foragers returning laden with pale yellow pollen. However, two were suspiciously quiet, with only a handful of bees going in and out 2. Almost none of the bees returning to these two colonies carried pollen. One was a five frame poly nuc in the bee shed. This had been made up in mid/late summer while the parental colony was requeened. 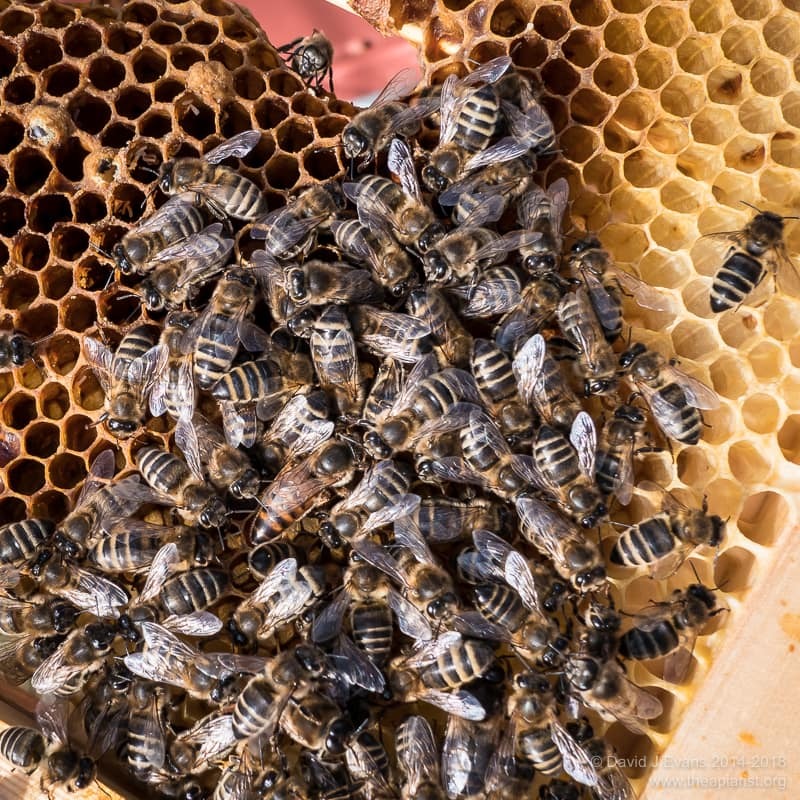 The old queen, a frame of emerging brood with the adhering bees and a frame of stores had gone into the nuc box. The little colony had built up reasonably well going by my infrequent peeks through the transparent crownboard, but not well enough to move them to a full hive for the winter. The other suspiciously quiet colony was a full (or full-sized 🙁 ) hive headed by one of the older queens in my apiary. Most colonies are requeened annually or every other year, but this one was reared in my first year in Scotland (2015) 3. I popped the lid off both colonies and examined them in greater detail. It wasn’t the recommended ‘shirtsleeve weather‘ by a long-shot, but I feared the worst and didn’t think a bit of cold would do these two any further damage. The nuc contained about a cup full of bees and a small, unclipped pale queen. This definitely wasn’t the queen I’d put in the box last August. For whatever reason, the colony had clearly replaced the queen late in the year. It hadn’t swarmed, so it looks like they’d tried to supercede the old queen. Going by the total absence of worker brood I presume the new queen hadn’t mated successfully, or at all, and that she was a virgin. She wasn’t running about skittishly like new virgin queens do, but she wasn’t doing anything very useful either. The full sized colony was only full sized in terms of the hive it occupied. Inside there was another rather pathetic cupful of bees together with a very tatty, marked and clipped queen 5. There was more paint on her head than her thorax and I remember marking her with a very ‘blobby’ Posca pen. This was the queen I’d expected to find in the box. There were no drones in this colony, but no eggs either. There was also no sign of a second queen or evidence of attempted supercedure. I suspect the ageing queen simply ran out of sperm, stopped laying and never got started again. Sometimes old queens turn into drone layers and sometimes they just stop. I’m not sure why they exhibit this different behaviour. It might actually reflect when they’re detected. I think I usually find drone laying queens a bit later in the Spring. Perhaps a failed queen starts laying (unfertilised) eggs only once the ambient temperature has risen sufficiently to help the much-reduced numbers of workers keep the brood nest warm enough? That’s guesswork. It’s still cold here, with frost most nights. The small number of bees in the colony would have been unable to maintain the mid-30’s temperatures required for brood rearing. It’s surprising they’d survived this long. Neither colony had any obvious signs of disease. The floor of the full hive was thigh-deep – if you’re a bee – in corpses. However, a good poke around through the cadavers failed to find any with signs of the deformed wings that are indicative of high viral loads. I hadn’t really expected to … the Varroa loads in this colony in the late-summer and midwinter treatments had been very low. Lose them or use them? Clearly both queens had failed. Both were despatched. To keep them in the vain hope that they’d miraculously start laying again would have been a waste of time and, more importantly, other bees. The virgin would now be too old to get mated and there won’t be drones available here for at least 6 weeks. This left the dilemma of what to do with the remaining bees. Both colonies were apparently healthy, but too small to survive. In the autumn the obvious thing to do is to unite small healthy colonies with large healthy colonies. 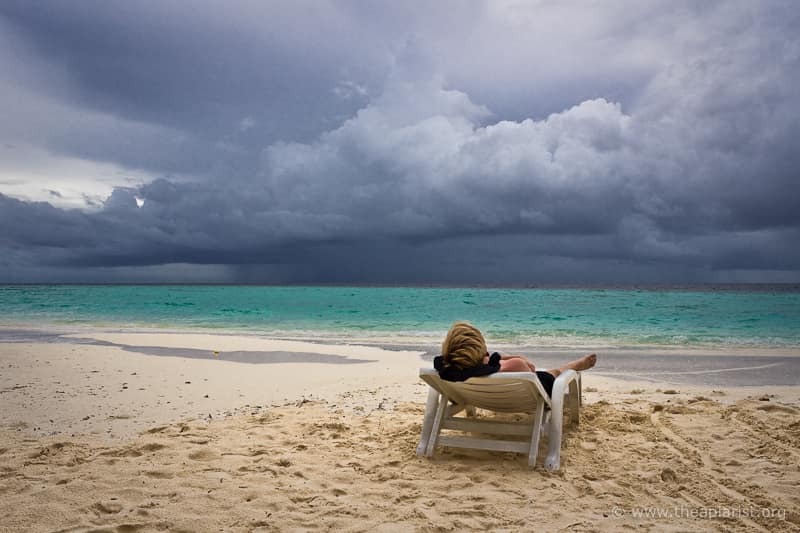 This strengthens the latter further and helps them get through the winter. However, this is the Spring. 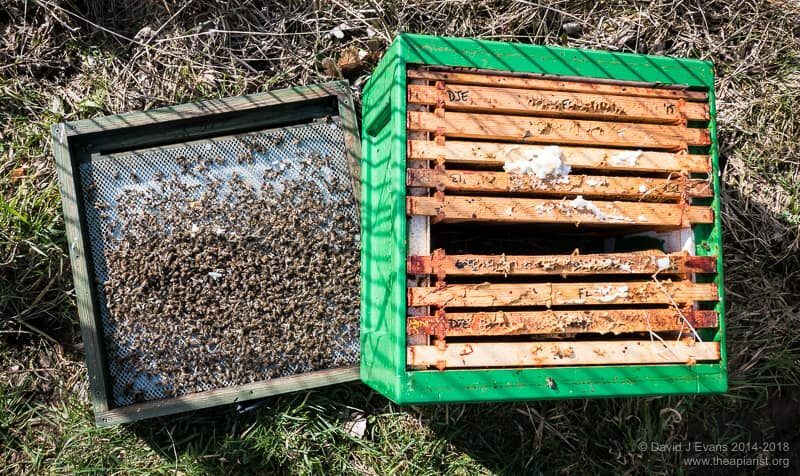 There were probably no more than 300 bees in either of the failed hives. All of these bees would have been at least 3 months old, and quite probably significantly older. They were unlikely to live much longer. Furthermore, uniting these small colonies with larger colonies in the apiary would have caused disruption to the latter and increased the volume of the hive to be kept warm. Neither of these are desirable. I therefore shook both small colonies out allowing the healthy flying bees to redistribute themselves around the half dozen strong hives in the apiary. Before shaking them out I either moved the original hive altogether or – in the case of the nuc from the shed – sealed the entrance, forcing them to look elsewhere for a colony to accept them. 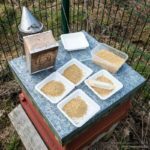 This entry was posted in Beekeeping, Principles, Queen failure, Seasonal and tagged DLW, laying workers, old queen, supercedure on March 30, 2018 by David.